Nashville walking tour offering you the sights and sounds of Music City! Our guides will personally take you back into Nashville's past and walk you to many historic locations. The tour begins in front of the Nashville Visitor Center located on Nashville's Lower Broadway. From there, you will travel about a mile & a half around downtown Music City taking in the sights and stories that made the city what you see today. We can guarantee you will experience the echoes of Nashville through old buildings, historic photographs, and great stories. Please look below at our calendar for our available tour times. Have questions? Please email us at tours@echoesofnashville.com or call us at 615-576-0804. Don't see the tour time you want? Give us a call or E-mail us at tours@echoesofnashville.com and we can do our best to arrange a tour for you (2 person minimum). We have special tours available that focus on specific aspects of Nashville's history, like the fearless women who influenced history. Plus, we have a creative team open to building a tour around your group. Click to see our Renegade Women tour. Need a “hop-on” tour guide for a brief history of Nashville? Whether you want to hire a guide for a brief tour or an all-day excursion, we will work with you to meet the needs of your group. Our guides will make your bus trip to Nashville a memorable one. Educators! Looking for a unique field trip? Want something that will get your students moving AND learning? Contact us about out educational experiences. We develop our educational tours to meet curriculum standards so you won’t have to. Family reunion? Bachelorette/Bachelor trip? Staff meeting? Church outing? Conference? If you are looking for a unique way to experience the city, please contact us for private group rates. We can accommodate many group sizes and styles. Jeff Sellers has been an interpretive guide in Nashville for nearly 10 years. He currently works full time at the Tennessee State Museum as the curator of education. He gives tours of the Tennessee State Capitol as well as the Tennessee State Museum and has led tours at Stones River National Battlefield. He holds a masters degrees in public history from Middle Tennessee State University and education from the University of Montevallo in Alabama. Jeff enjoys fishing, football, and family, but not necessarily in that order. His passion is Nashville's history and sharing that passion with others. He has a beautiful wife and two wonderful kids. Aja Bain moved to Nashville in 2007 for college and quickly grew to love this friendly and musical city. Her weekday job is with the American Association for State and Local History helping small museums protect and share their heritage. She holds a B.A. in history from Vanderbilt University and an M.A. in Public History from Middle Tennessee State University. She serves as the president of ICON, the Inter-Museum Council of Nashville. In her free time, she loves traveling, hiking, reading, and enjoying Nashville's parks and music venues. Gib Backlund has presented tours and programs at a variety of historic sites and natural areas including Fort Vancouver, Mammoth Cave, and Chicamacomico Lifesaving Station. He has a master’s degree in history from Middle Tennessee State University and a bachelor’s in English from the University of Minnesota. He enjoys rock’n’roll, food, being a tourist, exploring the underbelly of cities, and writing. Casey Gymrek grew up in Florida where she split her free time between volunteering as a historical interpreter and a theatrical performer. She received bachelor's degrees in Anthropology and History from the University of Florida. She moved to Tennessee three years ago for a master's degree in Public History from Middle Tennessee State University. Currently, Casey is an education specialist with the Tennessee State Library and Archives, where she terrorizes archivists with 4th graders in the archives on a daily basis. When she isn't leading tours, you can find Casey hanging out in East Nashville exploring local restaurants, breweries, and music venues. Echoes of Nashville is a new walking tour company located in downtown Nashville, Tennessee. We are professional historians that love our city and love connecting people to the historic side of Music City. Not only is Nashville world renowned for the music it creates, it is also one of the most historic cities of the South. From Indian battles to the birth of country music, let us connect you to a side of Nashville you never knew. 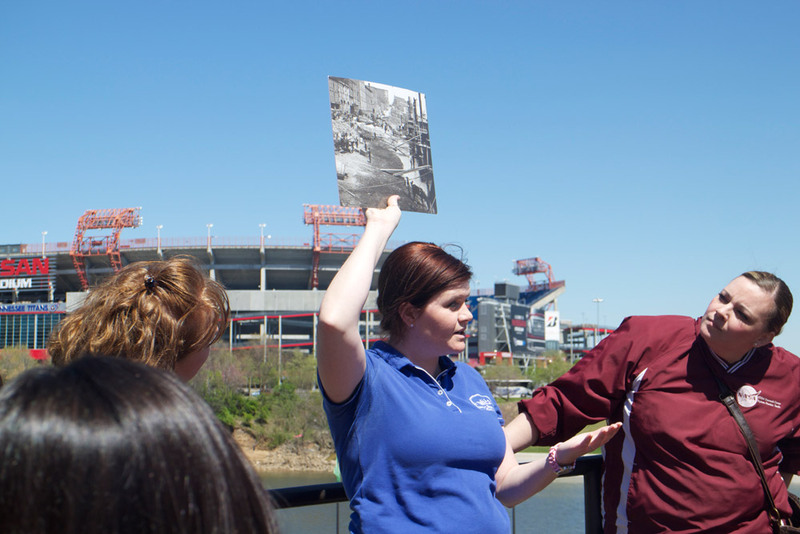 The mission of Echoes of Nashville is to enrich the lives of our guests by connecting them to Nashville’s rich history and providing a meaningful, and memorable tour experience, and as a result allowing us to support historical organizations and heritage tourism in Nashville. Your guide will meet you at the corner of 5th Ave and Broadway, next to the black Bridgestone Arena sign. To GPS the location, the address is 501 Broadway, Nashville, Tennessee. We always wear blue polos or vests on tour day. Click: Book now to see our full calendar with available tour times. What if I want to walk up without a reservation? While reservations are suggested, we will certainly do what we can to accommodate you if you walk up and want to join us on our tour. Don’t be a stranger! Tickets are $20 for adults. Children ages 5 to 12 are $10. Children ages 4 and under are free. Rain did not stop history, so we don’t let it stop our history tours! Our tours go on rain or shine. We only cancel tours for severe weather (and will contact you if the tour is cancelled). Tours can be cancelled up to 24 hours in advance with no cost penalty. If a tour is cancelled by the guide because of weather, you will be reimbursed. Is the tour route handicap accessible? Yes! While the tour route meanders over gentle hills in the city, there are ramps and elevators so every part of the tour is accessible. Our guides work hard to share the past with you; if you feel they did a good job, you may certainly tip them accordingly.